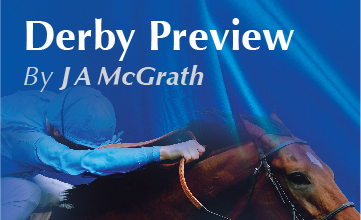 This year's Derby has been spoken of as the most open in years, and with uncertainty about the weather, plus on-going speculation over the relative merits of the 16 runners, the Classic is living up to that billing. This year's G1 Investec Derby has been spoken of as the most open in years, and with uncertainty about the weather, plus on-going speculation over the relative merits of the 16 runners, the Classic is living up to that billing. Of course, that is not to say that a truly outstanding colt cannot emerge at Epsom this Saturday. There is quality everywhere - and the principals from the traditional Derby trials, at Sandown, Chester, Lingfield, York, Leopardstown, and Saint-Cloud, all take their chance. It is about peaking on the big day, and several are poised to launch as top class racehorses. Godolphin have two excellent contenders for Derby honours. The Jim Bolger-trained Moonlight Magic, winner of three of his four starts, comes to the Classic off the back of a fine win in the G3 Derrinstown Stud Derby Trial at Leopardstown - and the Andre Fabre-trained Cloth Of Stars, who ran home well to land the G2 Prix Greffulhe at Saint-Cloud, also has strong claims. Bolger has long been singing the praises of Moonlight Magic, and when the colt suffered a shock defeat in the G3 Ballysax Stakes at Leopardstown on April 10, there were many puzzled faces. But the colt soon bounced back from that lack-lustre display and has since pleased his trainer. The key to working out the Derby is to accurately evaluate the trials. The Dante is traditionally the best of the British, and the John Gosden-trained Wings Of Desire showed himself to be a fast-learner when he beat Deauville at York, though the well-regarded Midterm was injured and did not run his race, and that devalued it as a trial. I liked the way US Army Ranger 'danced' around tight Chester in the Vase, though Port Douglas showed he was not far away in terms of class. Humphrey Bogart, the Lingfield Derby Trial winner, is an admirable type but the suspicion is that he may be found out in a much tougher race. Algometer is a progressive colt, who is certain to stay the trip, and though he will no doubt be a major contender for the G1 St Leger later in the year, he is a rapid improver and must be respected. Bolger won the Derby for Her Royal Highness Princess Haya of Jordan when New Approach outclassed his rivals in the 2008 renewal, and he now has an excellent chance of a repeat with Moonlight Magic, whose pedigree is steeped in Derby tradition. The colt's grand-dam, the great Urban Sea, produced both Galileo (2001) and Sea The Stars (2009), while the sire of his dam, the unbeaten Lammtarra, won the Derby in 1995. Moonlight Magic, being by Cape Cross, is a three-quarter brother to Sea The Stars. He has both the looks and pedigree to win the Derby.